For some years I have been trying to get an MSP to give me a weekly report on what they actually do during their working life. I feel it is important to understand what the work of a MSP (Member of the Scottish Parliament) involves. My thanks to Linda Fabiani for volunteering to provide a weekly digest or her day to day work both at parliament and in her constinuency. I might add that I have contacted each political party in Scotland and so far Linda is the only one to have volunteered to do this work for us. Linda has been a Central Scotland MSP since 1999. She is the Convenor of the European and External Relations Committee of the Scottish Parliament and a member of the Standards and Public Appointments Committee. 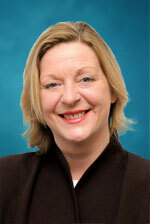 She was part of the steering group which brought fair trade status to her home town of Strathaven. Her interests include world politics and the search to end global poverty and seek social justice in all nations. What she most enjoys, however, is delivering for the people of Central Scotland, dealing with issues which concern everyone in their daily lives, from health treatment to education. A Scottish politician has received one of Italy's highest honours in recognition of her work to promote relations between the two countries. 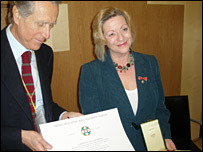 MSP Linda Fabiani was awarded the Cavaliere dell'Ordine della Stella della Solidarieta' Italiana. The accolade, bestowed in Edinburgh, translates as Knight of the Order of the Star of Italian Solidarity. Ms Fabiani, a Nationalist MSP for the Central Scotland area, said the honour would help boost relations. The accolade was presented by Italian ambassador Giancarlo Aragona during a ceremony at the Scottish Parliament. He said of Ms Fabiani: "She is living testimony of the very successful marriage between Italian and Scottish values, while being very active and successful in Scottish politics."